Seattle: Lowman & Hanford Stationery & Pringint Co, 1896. 23pp. 12mo. Original printed pictorial wrappers, with vignette above. Bookplate of John Lawson on front wrapper verso. Wrappers slightly chipped and soiled, but a very good copy of a scarce and fragile item. An excellent copy of this fragile indigenous-language dictionary. 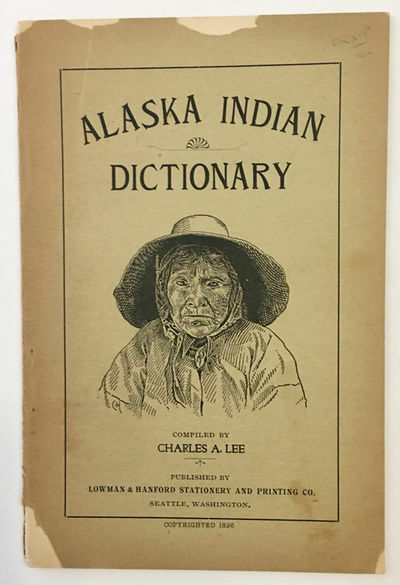 Above the vignette portrait cut of an Indian wearing a broad-brimmed hat, the cover title reads, "Alaska Indian Dictionary," and the sub-title on the main titlepage is, "Common words in the dialects of the Aleutian Indian language as spoken by the Oogashik, Egashik, Egegik, Anangashuk, and Misremie Tribes around the Sulima River and neighbouring parts of the Alaska Peninsula." Not in Vancil. BANKS, p.64. EDWARDS, p.17. SMITH 5799. WICKERSHAM 2590. AYER INDIAN LINGUISTICS (ALEUT) 7.